Traditional CDI programs focus on inpatient ICD-10-CM/PCS coding rules and regulations and payment methods. As organizations expand into outpatient/physician practices and other settings, a firm understanding of evaluation & management (E/M) code assignment factors will help ensure not only physician support for CDI efforts on the inpatient side but also medical record and reimbursement accuracy on the outpatient side. 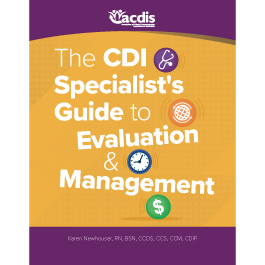 The CDI Specialist's Guide to Evaluation and Management training guide outlines the essentials of the E/M coding system and provides analysis and insight into what aspects of CDI efforts work best to engage physicians and improve outcomes related to the complexities of E/M. CDI professionals who understand why and how physician documentation affects the physicians’ own coding and billing system fare better when it comes to physician engagement in CDI efforts. This book provides an in-depth look at how E/M codes are built and which documentation matters most based on the setting of the patient encounter. Karen Newhouser, RN, BSN, CCDS, CCS, CCM, CDIP, is the director of Clinical documentation improvement (CDI) education for MedPartners in Tampa, Florida. A nurse with 40 years’ experience, with a specialization in critical care, Newhouser has extensive experience in quality initiatives involving patient safety indicators, hospital acquired conditions, core measures, sepsis, and malnutrition, as well as ICD-10 education, auditing, data analysis, and reporting. Newhouser transitioned to a role in case management in 2001 and CDI in 2004. In 2011, she earned a certificate in medical coding and billing as well as the Certified Clinical Documentation Specialist (CCDS) credential. That same year, Newhouser co-presented a poster for the fourth annual Association of Clinical Documentation Improvement Specialists (ACDIS) conference and joined MedPartners as the CDI supervisor at Barnes-Jewish Hospital in St. Louis. She has since been a valued speaker at numerous ACDIS and American Health Information Management Association events. Of late, Newhouser has focused on CDI opportunities in the outpatient environment and was a speaker at the inaugural ACDIS outpatient symposium in 2017. She also recently developed an extensive outpatient CDI academy for MedPartners. Having been a mentor and preceptor throughout her career, she transitioned to the position of director of CDI education for MedPartners in 2014. In 2015, Newhouser earned the prestegious CDI Professional of the Year Award and was nominated to serve as an ACDIS Advisory Board member. Contact her at knewhouser@medpartners.com.